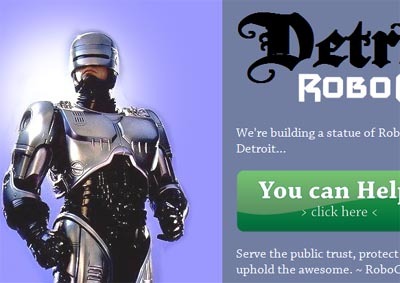 The inhabitants of Detroit have been pushing for a long time for the city to put up a statue of Robocop to honour their heroic cyborg crimefighter. Sadly, the mayor isn’t a science fiction fan and he has said that he’d be spending money on a robocop statue over his dead body. So what’s to do? Well, the good citizens of that fine town have now banded together and are now raising the money to put the statue up themselves! They are fast heading for $14,000 already raised. Stick it to the man, baby, stick it to the man. All together now… I’d buy that for a dollar!